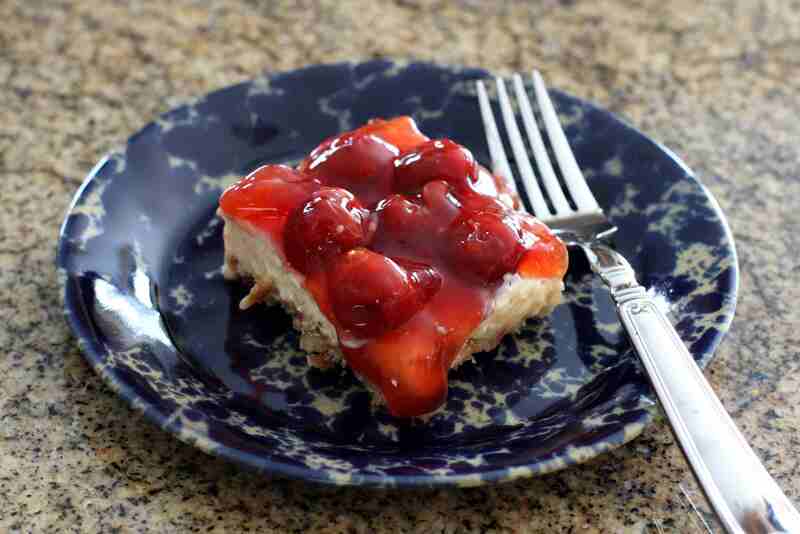 This layered cherry pretzel dessert is made with a salty crushed pretzel crust, a sweet pudding filling layer, and the easy cherry pie filling topping. It's one of my all-time favorite fruit desserts. This wonderful, gooey caramel apple cake is finished with a homemade caramel sauce. The sauce, which is very easy to prepare, is poured over the hot cake and allowed to sink into it. Serve the cake warm with a scoop of vanilla or butter pecan ice cream or a dollop of whipped cream or whipped topping. If you don't have the time or patience to make a homemade lemon meringue pie, make these heavenly lemon squares. They have all the lemon flavor anyone could ask for, and simple buttery shortbread makes the perfect crust. The filling in this fantastic spiced pear crisp is made with fresh, thinly sliced pears sweetened with brown sugar and flavored with a little cinnamon and vanilla. The topping is a classic butter, brown sugar, and oat mixture. It's a perfect fall dessert to serve with ice cream. This spiced pumpkin pudding tastes just like a pumpkin pie, but without the crust. It tastes great and it's easy to make and bake. Bake it in a casserole or individual ramekins and serve it with fresh whipped cream and cinnamon sugar for the topping. This sweet potato loaf cake with cream cheese frosting is a moist and flavorful cake, and it is a nice size for a small group. The cake is topped with cream cheese frosting and crunchy toasted coconut. Or top it with toasted pecans. Home-style banana pudding is always a hit. Layer the ingredients in a large glass bowl for a beautiful presentation, or use individual dessert dishes or glasses. This recipe is completely homemade, but if you are short on time, use your favorite packaged vanilla pudding (preferably not instant) for the filling. The lightly spiced buttery brown sugar and oat combination is the perfect topping for this wonderful blueberry crisp. Even the most ardent pie lovers will be happy with this dessert. This delicious peach bread pudding is made with canned diced peaches, making it a dessert you can enjoy any time of the year and for any occasion. Drizzle the pudding with warm butterscotch sauce or caramel sauce. This is a fantastic cheesecake to bake for a special occasion. The rich brown sugar filling is awesome, and the caramel pecan sauce tops it off perfectly. If you're looking to impress, bake this brown sugar cheesecake with caramel pecan topping. Putting carrot cake into cupcake form makes it lots of fun, and no less delicious. These moist cupcakes are topped with fluffy cream cheese frosting. The cream cheese-filled pumpkin cake roll is a popular, top-rated recipe. The cake is a delicious, impressive dessert for a holiday meal, or bake it to have on hand for guests. We like to keep individual slices frozen for unexpected guests.